- Publisher What are the core values of your ministry?Values-Driven Leadership is a pioneering work designed to help church and parachurch leaders understand the cutting-edge concept of organizational core values. Every ministry organization has a set of core values that guides what the ministry seeks to accomplish. Understanding these core values is key to a high-performing ministry.In this revised edition, Aubrey Malphurs offers important insights on new research in the field of leadership and delineates techniques for their practical implementation. After exploring the concepts in Values-Driven Leadership, you'll be able to take concrete steps to write your ministry's values in a credo or value statement and focus in on your mission. This edition includes helpful discussion questions, core values audits, and even a readiness-for-change inventory to help you and your ministry identify areas in need of attention. This is a useful book for individuals, boards, committees, and leadership teams.Aubrey Malphurs is professor of pastoral ministries at Dallas Theological Seminary. He is the author of more than fifteen books as well as president of The Malphurs Group (www.malphursgroup.com), a training and consulting firm. 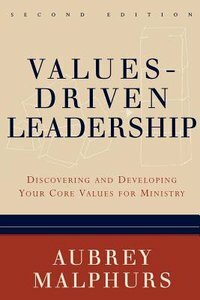 About "Values-Driven Leadership (2nd Edition)"
What are the core values of your ministry?Values-Driven Leadership is a pioneering work designed to help church and parachurch leaders understand the cutting-edge concept of organizational core values. Every ministry organization has a set of core values that guides what the ministry seeks to accomplish. Understanding these core values is key to a high-performing ministry.In this revised edition, Aubrey Malphurs offers important insights on new research in the field of leadership and delineates techniques for their practical implementation. After exploring the concepts in Values-Driven Leadership, you'll be able to take concrete steps to write your ministry's values in a credo or value statement and focus in on your mission. This edition includes helpful discussion questions, core values audits, and even a readiness-for-change inventory to help you and your ministry identify areas in need of attention. This is a useful book for individuals, boards, committees, and leadership teams.Aubrey Malphurs is professor of pastoral ministries at Dallas Theological Seminary. He is the author of more than fifteen books as well as president of The Malphurs Group (www.malphursgroup.com), a training and consulting firm.